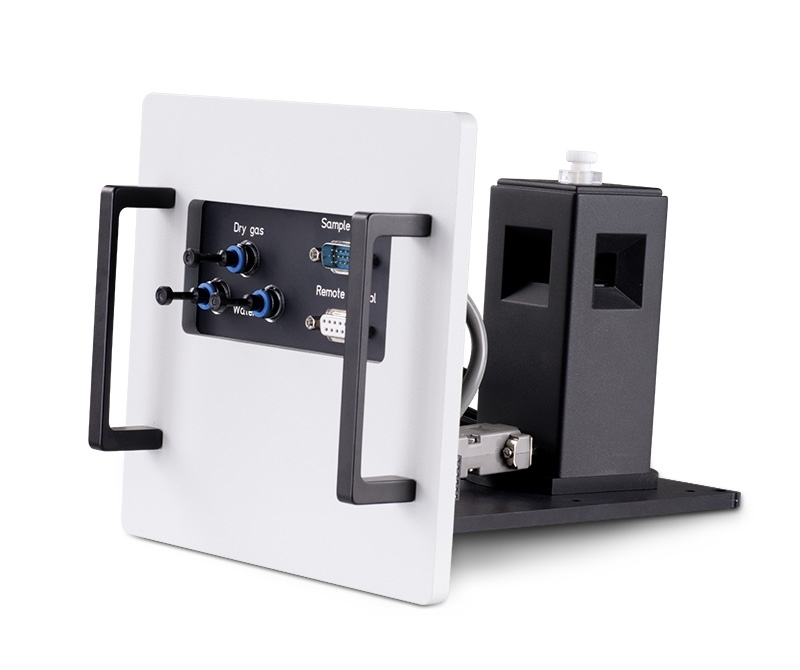 All components (attenuators, polarizers and filter wheel) in the optical beam paths are motorized and controlled by the EasyTau 2 software. 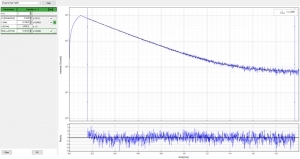 Emission wavelength selection is implemented via a motorized filter wheel equipped with various cut-off or bandpass filters as selected by the customer. 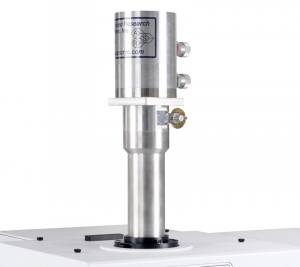 An optional monochromator is available for the UV/VIS spectral range. The FluoTime 250 uses picosecond pulsed lasers diodes and LEDs from PicoQuant’s LDH and PLS series, covering a spectral range from 255 to 1550 nm. 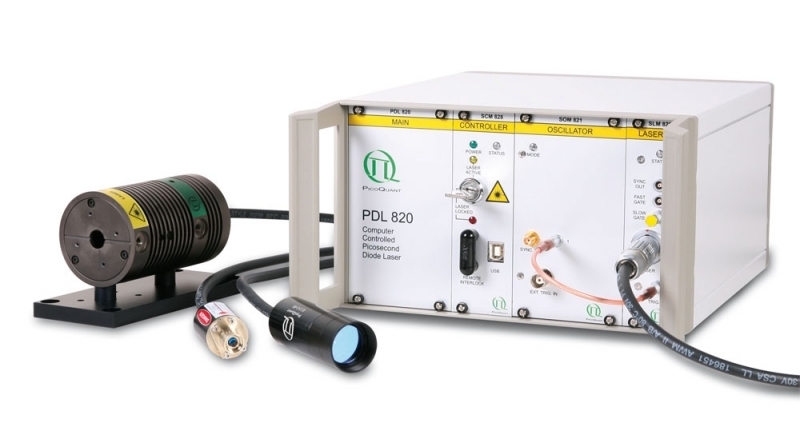 All excitation sources are controlled via a PDL 820 laser driver, which allows not only to vary output power and repetition rates (up to 80 MHz) but also supports burst mode for selected laser heads. Several outstanding data acquisition units are available with various temporal resolutions (from 4 ps to 250 ns). 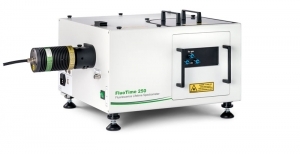 Coupled with the right detectors from the PMA or PMA Hybrid Series, the FluoTime 250 is capable of measuring time-resolved emissions with lifetimes ranging from approximately 10 ps up to several hundreds ms. 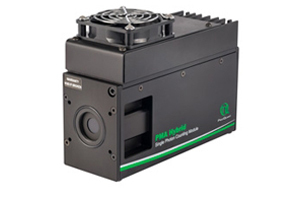 The FluoTime 250 can be equipped with a single photon counting detector from either the PMA or PMA Hybrid Series. These detectors offer picosecond temporal resolutions and cover different spectral ranges between 180 and 920 nm. For studies in the near infrared, a PMT module with sensitivity from 950 to 1400 nm is also available. Each detector includes an electro-mechanical shutter, active cooling, and overload protection. 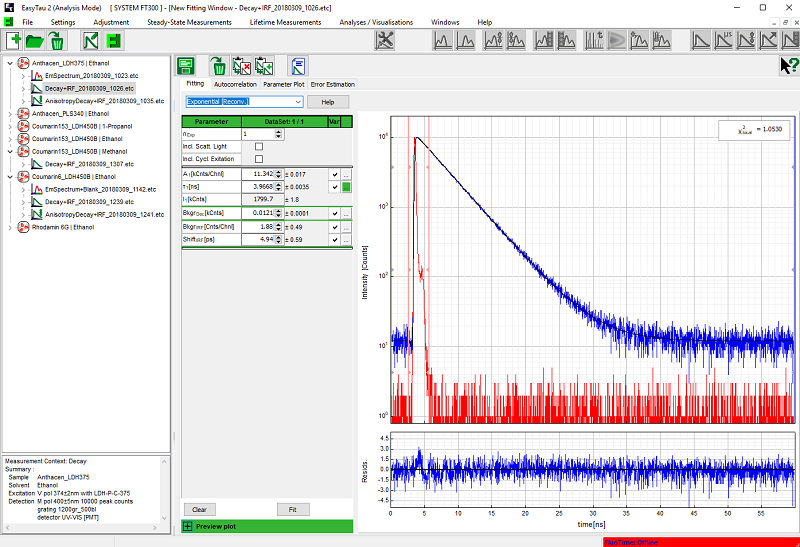 The EasyTau 2 software package is the one-stop solution for both full hardware control of the FluoTime 250 as well as for interactive data analysis and fitting. The software offers a Windows-based graphical user interface with dedicated applications wizards guiding users through the optimization and data acquisition process for many common applications. Advanced users get full control over all instrumental aspects thanks to a customized mode and scripting language. 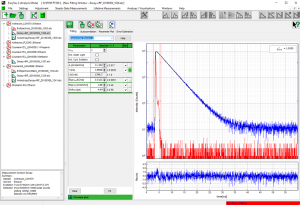 The integrated analysis and fitting module supports a broad range of time-resolved spectroscopy applications, such as fluorescence and phosphorescence decays, or anisotropy measurements. A powerful report generator allows creating presentation-ready graphical and numerical output. 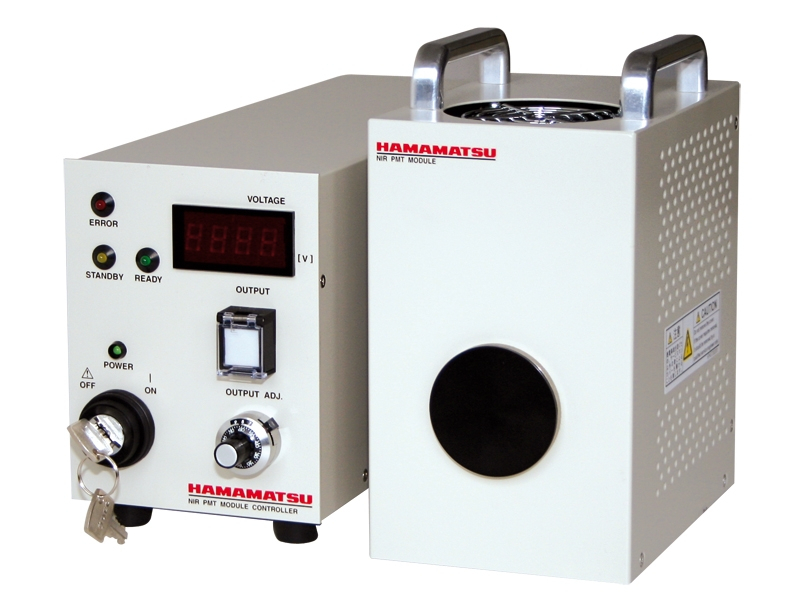 This sample mounting unit for 1x1 cm cuvettes features a peltier cooler cooler with a temperature range of -15 to 110 °C. The holder is fully controlled by the EasyTau 2 system software and can thus be automated to carry out measurements at various temperatures. Sample mounting unit with temperature stabilzed holder for 1x1cm cuvettes. This sample holder can be connected to an external water bath for temperature stabilization via a series of cable glands at the units front side. 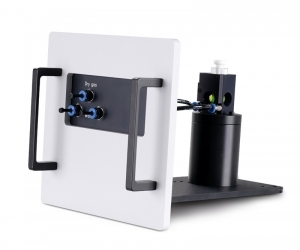 The mounting holder is designed for measuring small solid samples including wafers, coated substrates, or thin films. 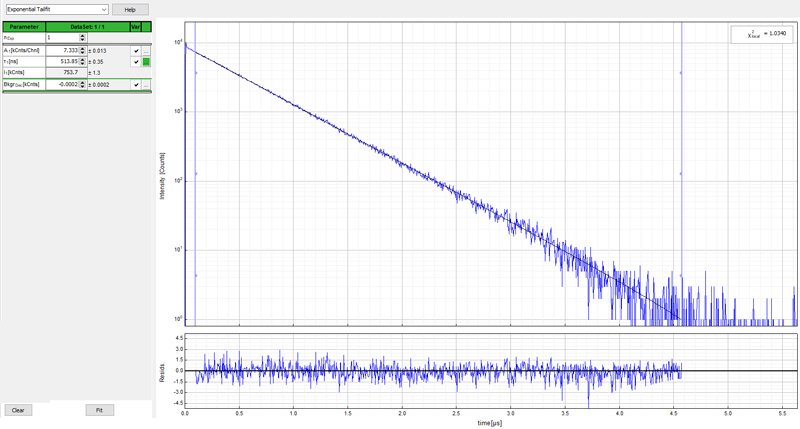 The sample position and angle with respect to the excitation beam can be manually adjusted. The sample mounting unit is provided with a liquid nitrogen cryostat. 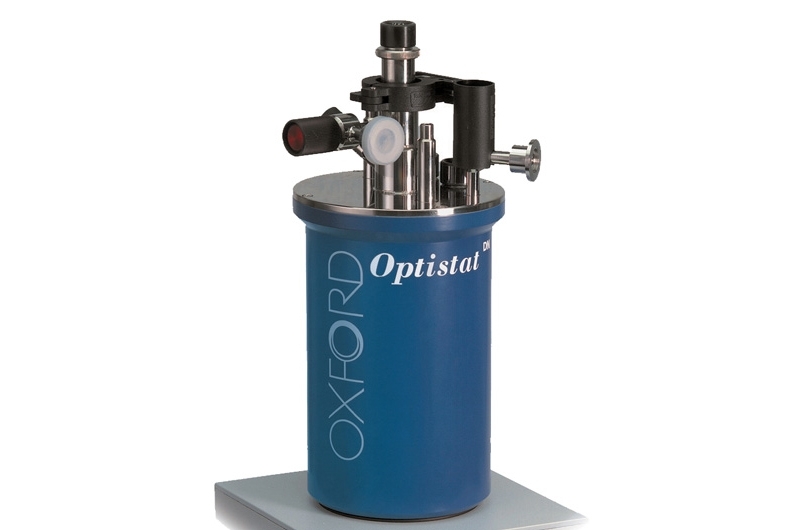 The temperature range of the cryostat is 77 to 500 K. The sample mounting unit is equipped with an adapter to fit to the sample chamber. The closed-cycle helium cryostat is a compact, axially symmetrical, closed-cycle cryocooler. 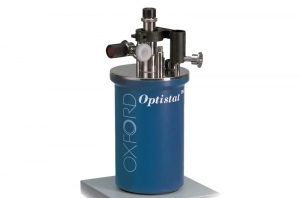 This cryostat enables low temperature photoluminescence measurements from 4 to 500 K.
This special photomultipliers are suitable for single photon counting in the NIR. The PMT features an InGaAsP photocathode and is sensitive in the wavelength range from 950 to 1400 nm (1700 nm). The module has a thermally insulated sealed-off housing evacuated to a high vacuum. No liquid nitrogen, vacuum pumps nor water cooling is necessary. 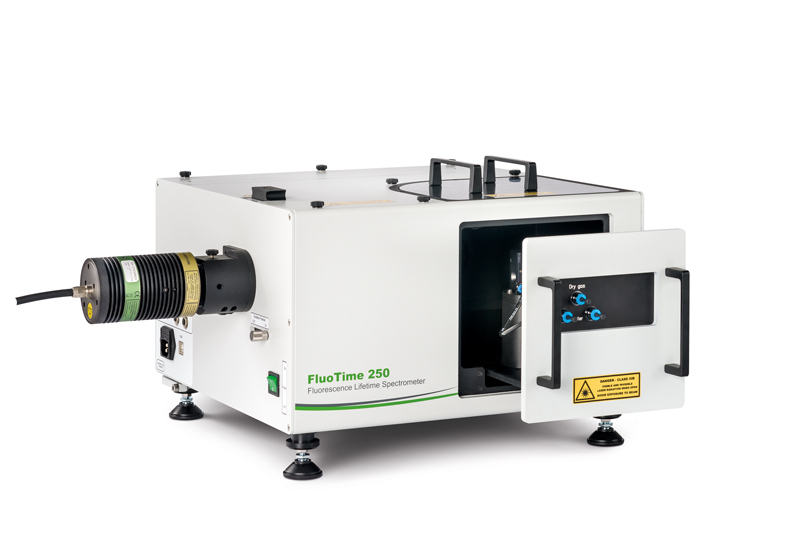 Both FluoTime 250 IRFs were determined using a scattering reference solution (LUDOX dispersed in water). 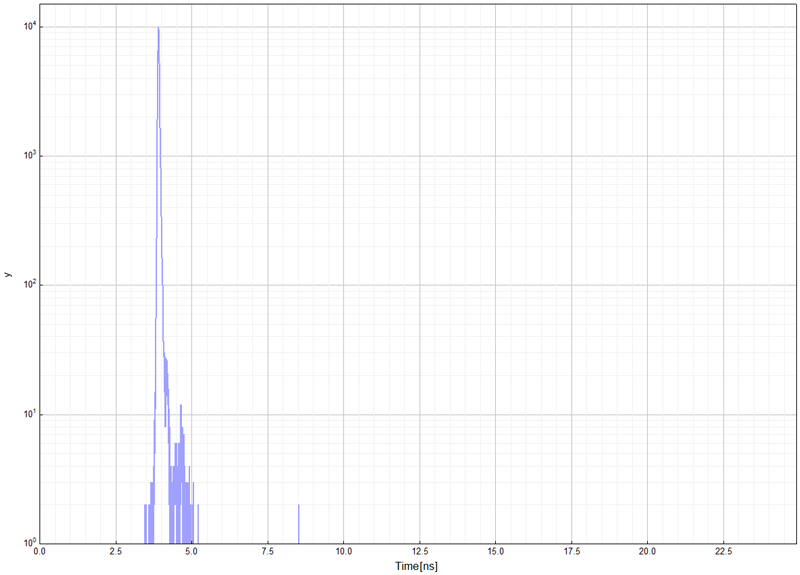 In order to obtain the IRF in the visible range, the LUDOX sample was excited at 405 nm with an LDH-P-C-405B. 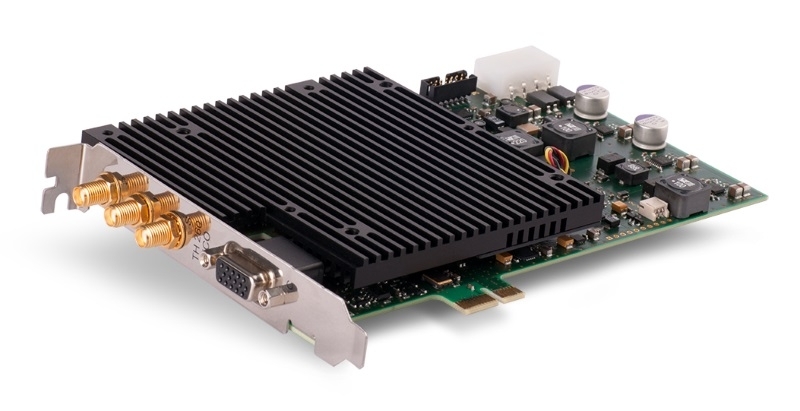 A PMA-Hybrid 06 connected to a PicoHarp 300 TCSPC unit was used for data collection. The collected data was analyzed using the fitting mode of the EasyTau 2 and an IRF of 57 ps was achieved for the FluoTime 250 with and without optional monochromator. 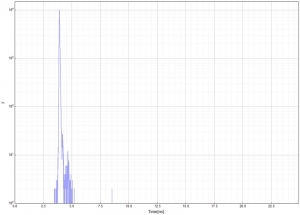 To obtain the IRF in the NIR range, the LUDOX sample was excited at 980 nm with an LDH-D-C-980. The light was detected with an NIR photomultiplier tube conntected to a TimeHarp 260 Pico TCSPC card. 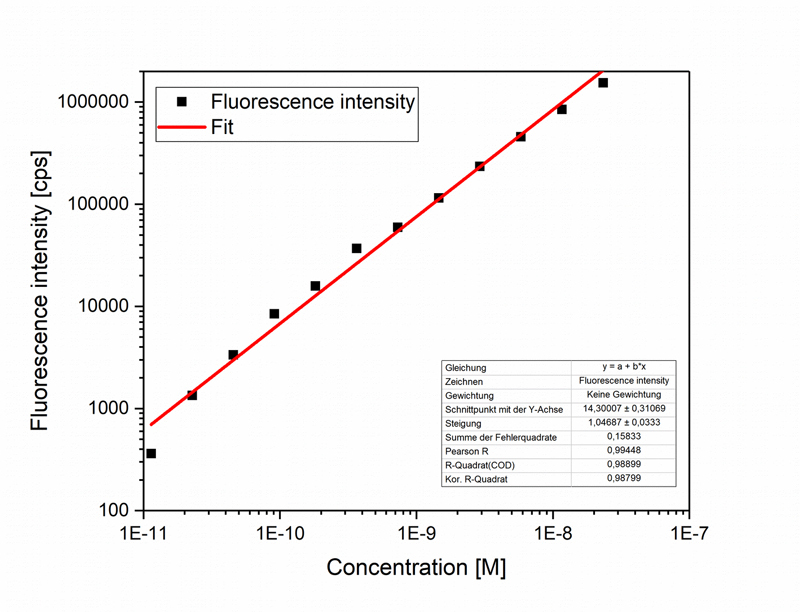 Analysis of the collect data thorugh the EasyTau 2 yielded an IRF of 279 ps for the FluoTime 250. 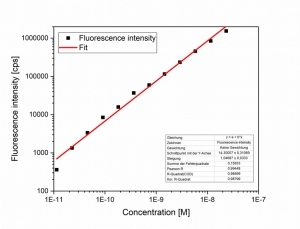 Determining the sensitivity of the FluoTime 250 was done by measuring a dilution series of Coumarin 6 in ethanol. 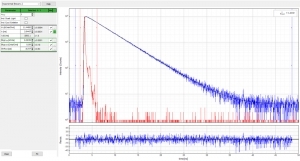 Excitation at 440 nm and emission was detected at 495 nm with a PMA-Hybrid 06 detector connected to a TimeHarp 260 Pico TCSPC board. Analysis of the collected data was carried out with the EasyTau 2‘s fitting module. 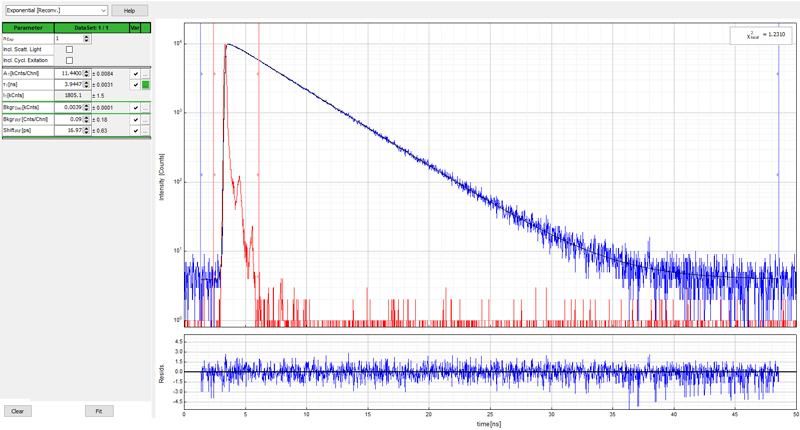 As the plot shows, we achieved a nice linear dependency on count rate vs. dye concentration down to 20 pM of Coumarine 6 in ethanol, which is a good illustration of the FluoTime 250‘s sensitivity. 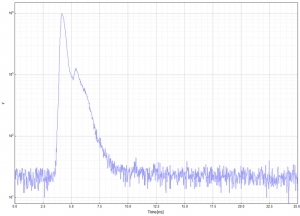 An aqueous solution of ATTO425 was excited at 418 nm using an LDH-P-C-420 laser diode head. The resulting emission signal was attenuated via automated attenuator and passed through a longpass filter (FGL495), both located in the emission pathway. 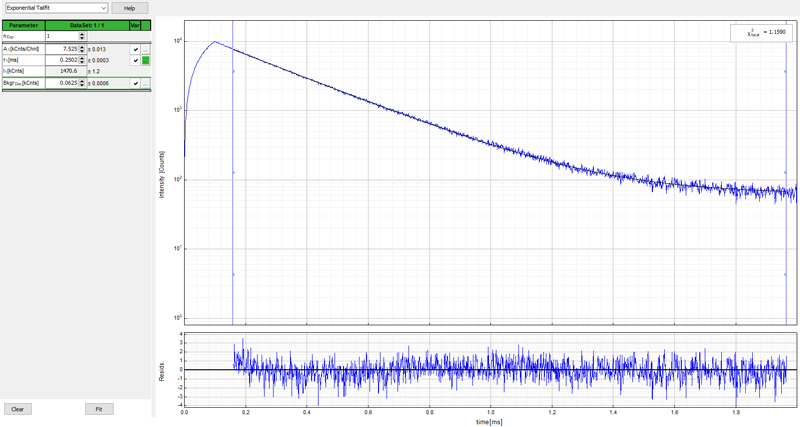 Emission intensities were recorded under magic angle conditions (54.7°) by a PMA 182 photomultiplier connected to a TimeHarp 260 Pico TCSPC card. The collected data was analyzed in the fitting module of the EasyTau 2 using a reconvolution tail fit. As expected, the ATTO425 decay could be well described with a single exponential decay function and the recovered lifetime of 3.950 ± 0.003 ns fits well with reported values. Error estimation was done via bootstrap error analysis. An aqueous solution of Ru3+(bpy)3 was excited at 418 nm using an LDH-P-C-420 laser diode head with burst mode excitation. The resulting emission signal was attenuated via automated attenuator and passed through a longpass filter (FGL495), both located in the emission pathway. Emission intensities were recorded under magic angle conditions (54.7°) by a PMA 182 photomultiplier connected to a TimeHarp 260 Pico TCSPC card. The collected data was analyzed in the fitting module of the EasyTau 2 using a reconvolution tail fit. As expected, the ATTO425 decay could be well described with a single exponential decay function and the recovered lifetime of 513.85 ± 0.35 ns fits well with reported values. Error estimation was done via bootstrap error analysis. An Nd:YAG crystal was excited at 506 nm using an LDH-P-C-510 laser diode head in combination with burst mode excitation. The resulting emission signal was attenuated via automated attenuator and passed through a longpass filter (LP900), both located in the emission pathway. 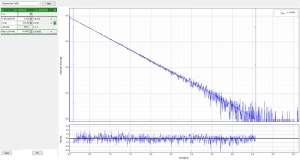 Emission intensities were recorded under magic angle conditions (54.7°) by a NIR photomultiplier connected to a TimeHarp 260 Pico TCSPC card. The collected data was analyzed in the fitting module of the EasyTau 2 using a reconvolution tail fit. As expected, the ATTO425 decay could be well described with a single exponential decay function and the recovered lifetime of 0.252 ms fits well with reported values. Error estimation was done via bootstrap error analysis.